Many dogs find fireworks scary. Whether it’s the British tradition of Bonfire night or Independence day in the USA, dogs and fireworks rarely go together. In fact, it’s estimated that just under half of all dogs are fearful of loud noises. While it’s possible to minimise trigger noises within our own homes, it’s unlikely that we can entirely protect our dogs from scary sounds. Unfortunately, if a dog is noise aversive (scared of loud sounds), their fear is unlikely to be limited to just fireworks. In fact, for sensitive dogs, any loud or unusual noise can trigger their fear. Anything from construction work, thunder, parties or even traffic noise can be scary to a dog that is vulnerable to noise. Although distressing to witness, a dog’s fear of loud noises is perfectly natural. As a normal part of their survival instincts, a loud noise triggers a dog’s nervous system, and they react as they would to a real threat. Typically, this involves running away or hiding until the threat is over. Unfortunately, this response in a dog with noise aversion is exaggerated and much more persistent, with the effects lasting longer even after the danger has passed. Noise aversion varies from dog to dog. While some dogs may just tuck their tails between their legs and hide behind the sofa. Other dogs will show behaviours that most closely resemble a panic attack. Even if your dog does display some or all of the above symptoms, don’t despair, there are lots of things you can do to make your dog more comfortable through the firework celebrations. With a bit of forward planning, both you and your dog will be able to cope more easily with the loud and unexpected noises of the night. So let’s have a look at what you can do to help keep your dog calm. Walk your dog early so that they are safely tucked away in the house before the fireworks begin. A scared dog is a danger to both themselves and others so make sure your dog’s collar or harness and leash are secure. Also, check that your dog has an up to date ID tag on just in case they escape. Once in the house, close the windows and curtains, put on some music or TV to muffle the sound of the fireworks. For dogs that like to hide, creating a quiet, secure den for your dog to use can be beneficial. Whether it’s an old blanket draped over a couple of chairs or a duvet in a cupboard your dog will appreciate a place where they feel secure. Unless absolutely necessary, don’t leave your dog alone, just like us things are much less scary when you have company. A stressed or scared dog often turns to its guardian for comfort. Don’t ignore them. You can’t make your dog’s fear worse by stroking or soothing it. However, try to remain calm yourself, dog’s do pick up on our emotions, so the more relaxed you are, the more you can help your dog. Food is a powerful means of distraction. While it may not work for all dogs, it’s well worth the effort in trying. There are two main ways that food can be used to help your dog during fireworks. The first is to use an interactive feeder, like a Kong. Fill the Kong and freeze it and offer it to your dog just before the fireworks start. Our dog’s innate desire to work for their food often means that interactive feeders are a naturally enriching experience. Not only that but the action of licking and chewing releases endorphins in our dog’s brain creating feelings of pleasure and comfort. The second way to use food as a distraction is to feed your dog small and tasty treats throughout the fireworks. This is classic counter-conditioning, pairing something pleasurable – the food with something scary -the fireworks. The idea is that eventually the noise that fireworks produce is so strongly associated with a tasty treat that it changes the way your dog feels about the sound. And as a result in the future, the sound becomes something that generates a positive response instead of fear. Both these methods rely on exceptionally tasty treats so stock up on your dog’s favourite food. While it’s often used as a last resort, Veterinarian prescribed medication is an option for dogs with severe noise phobia. These tend to be sedative based and take the edge off your dog’s fear. The earlier you talk to your vet the better as some of these medications take up to a week to become effective. There are also various types of natural options available. These range from Pheromone-based possibilities to pressure vests. Pheromone based products like Adaptil mimic natural chemicals produced by animals. These behaviour changing substances can alter how your dog feels or acts and can work well to reduce your dog’s fear or anxiety. Melatonin is a hormone-based alternative that is most often used to help promote and regulate sleep. However, because melatonin has sedative properties it also produces a calming effect and is commonly used for dogs suffering from anxiety. It’s readily available as an over the counter supplement for dogs and is often offered as an alternative to tranquillisers. These wraps and jackets are entirely safe and provide constant, gentle pressure around your dog’s midsection. Using soothing sounds to counteract the distressing sounds of the fireworks is a good option. Clinically researched Through a dog’s ear, has been designed to reduce a dog’s anxiety. 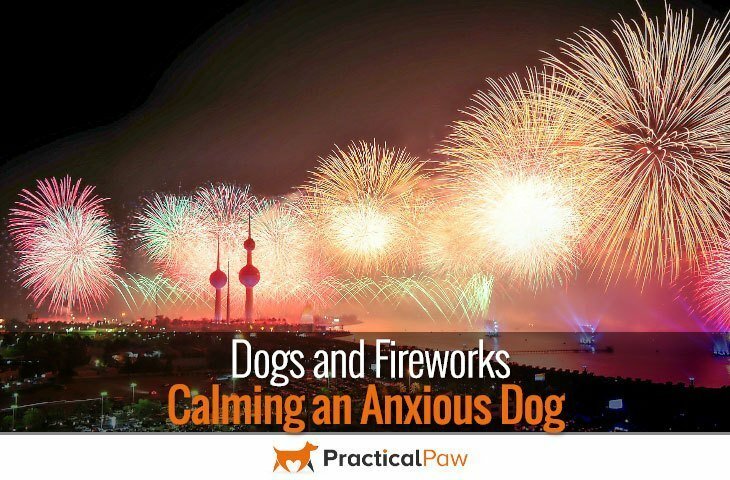 Ideally, play the CD in the week before the fireworks begin when your dog is already feeling relaxed and calm so that your dog starts to associate the sounds with being in a restful state. Play it again a couple of hours before the fireworks start and throughout the night until the fireworks stop. Sound therapy can be combined with the distraction technique of providing treats or an interactive feeder and works well. Look after your dog when it’s struggling with the noise of fireworks. Distract them, soothe them and provide a safe place for them to hide if they need one. Although not every dog will respond to these techniques it’s worth experimenting. Sometimes a combination of tools is the most effective and anything you can do to help reduce your dog’s fear is progress. Thankfully, fireworks are usually confined to a few nights of the year, so it’s easy to be prepared. With a bit of forward planning, both you and your dog can have a safe and relaxing night even with all the noises outside.